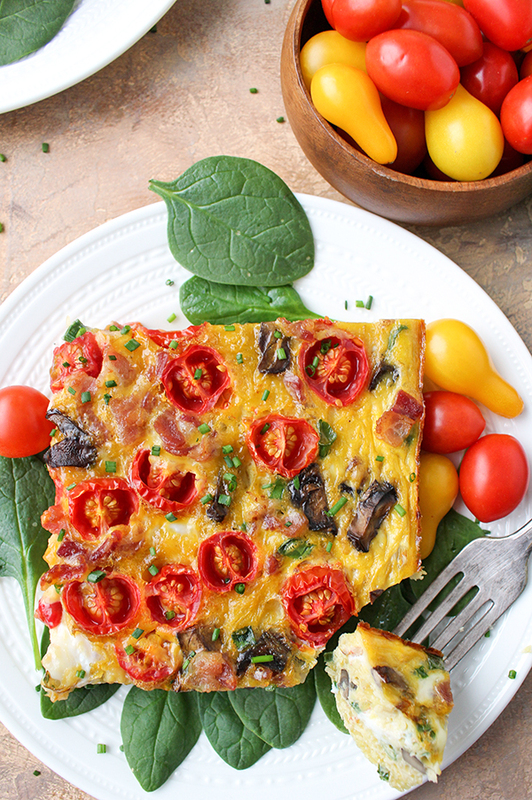 This Paleo Whole30 Spaghetti Squash Breakfast Casserole is hearty, packed with veggies, and a great make ahead breakfast. 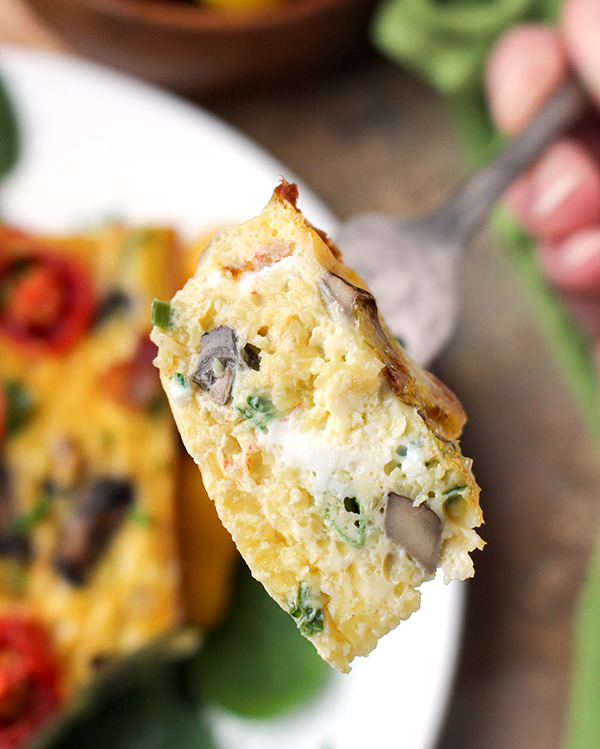 Gluten free, dairy free, and so delicious! I’ve been eating this for breakfast all week and loving it! It’s nice not having to think about what to make in the morning or do any cooking. Definitely worth the prep time on the weekend! The base is spaghetti squash which is pretty neutral in flavor, but adds heartiness and a little texture. It’s held together by eggs, which is also the source of protein. As long as you keep those two components the same, you can play with the other ingredients to customize them to your liking. I went with mushrooms, tomatoes, green onion and bacon and it was a great combination. If you used a heartier meat like sausage you could even get more servings out of it. As written, it makes 6 generous servings. 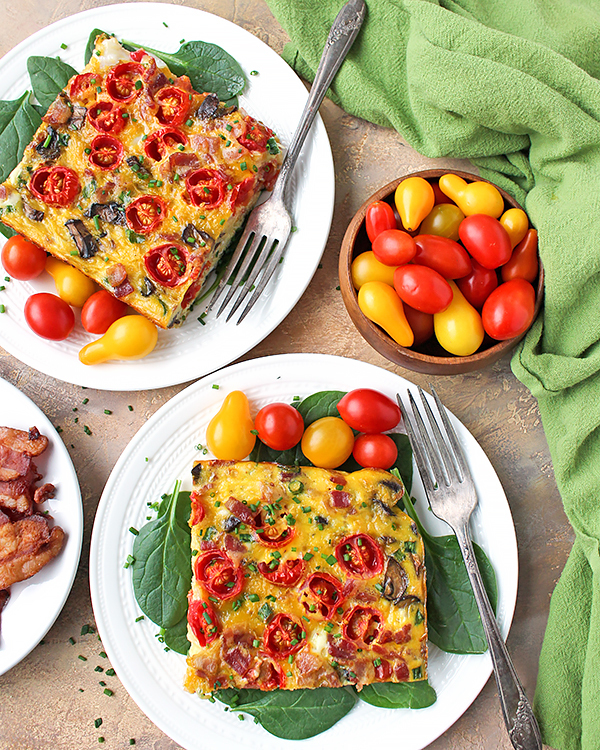 Paired with some fruit on the side and it’s a filling breakfast. There is a little prep involved with this casserole, but I found a way to make it as short as possible. Cooking spaghetti squash usually takes a long time, but making it in the Instant Pot only takes 7 minutes. 7 minutes!!! While that is cooking, the mushrooms and bacon are cooked and the tomatoes are cut. 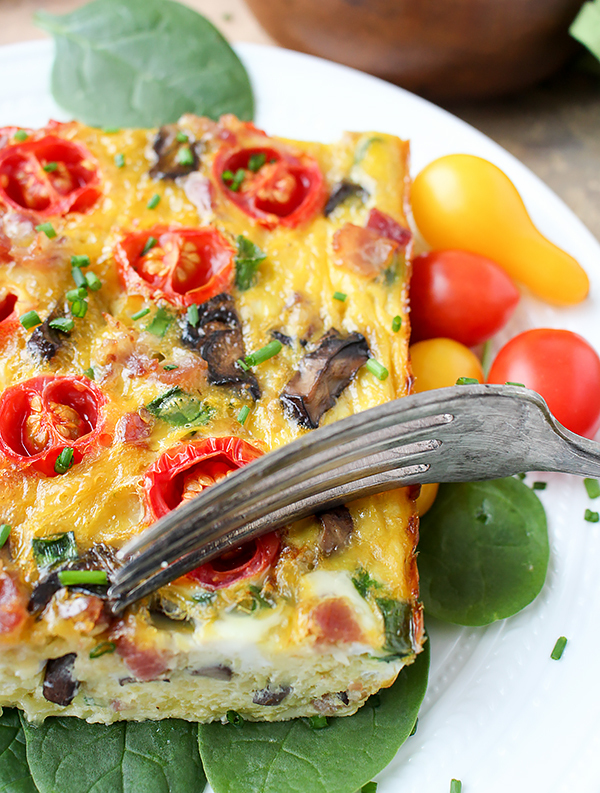 Then mix it all together, top with the eggs, and bake. So easy! If you don’t have an instant pot, HERE is my method of baking it in the oven. One important step is to squeeze the spaghetti squash really well after cooking because it holds a lot of moisture. Just use a clean kitchen towel and ring it out. 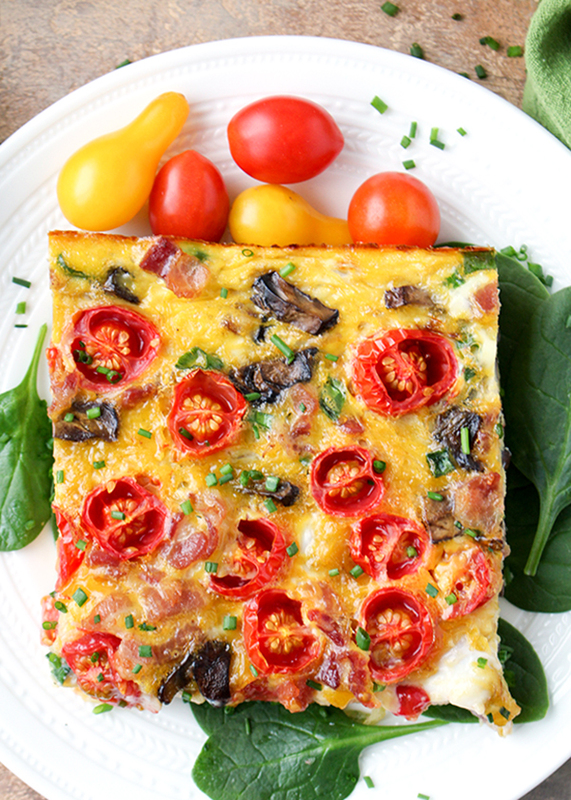 You will love this easy, flavorful, filling breakfast casserole. I’m already planning to make it again this weekend because I like it so much! Here are my other spaghetti squash casseroles that you will love: Paleo Whole30 Buffalo Chicken Casserole, Paleo Whole30 Barbecue Chicken Casserole, and Paleo Whole30 Baked Spaghetti. Cut the spaghetti squash in half diagonally. Scoop out the seeds and place both halves in the instant pot on the steamer rack. Add 1 cup of water to the pot, put the top on, make sure the valve is closed, hit "manual" and reduce time to 7 minutes. While the squash is cooking, cook the bacon and mushrooms. Cut the bacon into small pieces and cook in a medium to large skillet over medium heat. Once crispy, remove and place on a plate. Leave about 1 tablespoon bacon grease to pan and add in the mushrooms. Cook over medium heat until tender. Once the squash is done, hit "cancel" and release the valve. When the pin drops, open the lid and carefully remove squash to a bowl to cool a little. Once cooled enough to handle, shred into a large bowl (possibly the one you're already using) and squeeze out all the water. Add the bacon, mushrooms, green onion, salt and half the tomatoes to the spaghetti squash and mix well. Preheat the oven to 350° Line a 13x9 with parchment paper and add in the spaghetti mixture. Break the eggs into a medium bowl or measuring cup and whisk until well mixed and all yolks are broken. Pour over spaghetti mixture and mix a little to make sure it's combined and spread evenly. 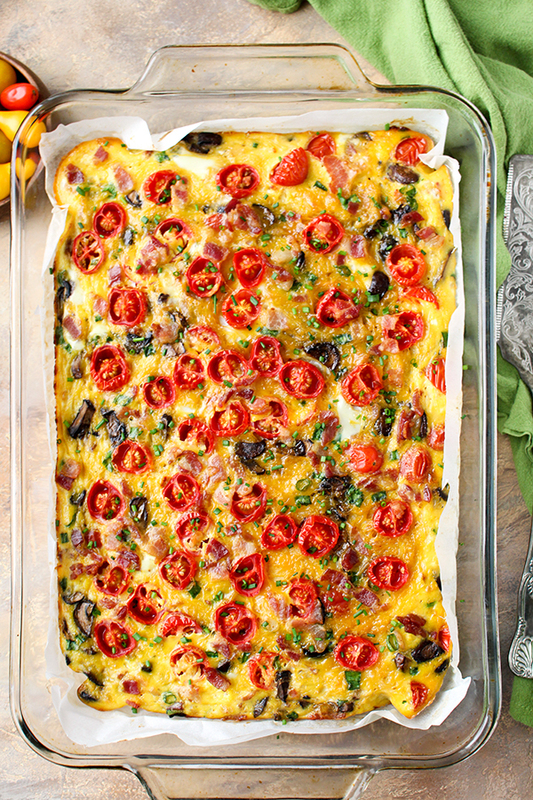 Top with the other half of tomatoes and bake for 50 minutes or until eggs are set. This is the 4th and best and easiest Whole30 breakfast bake I’ve done so far, and I even had to make the spaghetti squash the old fashioned way in the oven. So so delicious. 10/10 would recommend. Thanks, Anna! So glad you like it!